STAR CUSTOM LINE The Star Custom Line (SCL) is an exclusive, totally custom, limited production Raider for those wanting a truly unique chopper-inspired performance cruiser. Each bike has hand painted elements and features stainless steel braided lines, custom blacked-out hardware, genuine leather seat and a special metal SCL hologram badge on the top of the fuel tank. 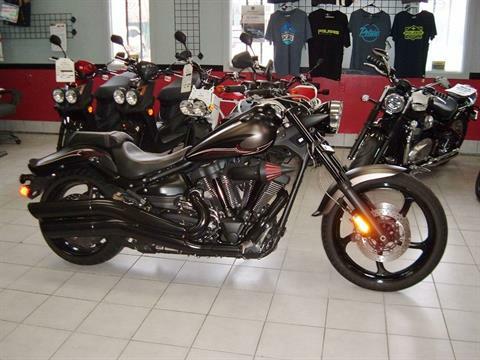 Plus all the addictive power and performance of the 113-cubic inch V-twin engine that is second to non in its class. Raider SCL (Star Custom Line) comes equipped with a custom leather seat, braided stainless steel throttle cables, clutch and brake hoses. Jewel-like fit and finish, and Star quality paint and attention to detail are evident all over the Raider SCL. Left-finger, trigger switch for select odometer, trip meters, operated high-beam switch, and right-thumb activated accessory driving light switch for great visibility. Stainless steel mesh throttle cables as well as clutch and brake lines give this bike a premium look. The flangeless fuel tank gets two-tone Matte Iron/Matte Raven paint for a rich, high quality look. It carries a full 4.2 gallons of fuel for an excellent cruising range. A tucked-out-of-sight single shock out back provides a smooth ride under varying loads. There’s 120/70-21-inch tire up front, and a wide, 210/40-18 out back—the tallest and widest ever on a Star. Low, sculpted rider and passenger seat of exclusive, two-toned beige and red stitching set this bike apart while maintaining the Raider’s casual, urban cruising style ergonomics. All-aluminum cast frame is light, rigid, and tuned for light, athletic handling. A light, Controlled-Fill, aluminum swingarm casting complements the bike’s lithe style. Two-into-one-into-two exhaust with Exhaust Ultimate Power valve (EXUP®) inside boosts torque in the 2,500~3,500-rpm range. Clutch has light, easy-pull operation. An exclusive metal SCL badge with hologram is placed on top of the fuel tank as a constant reminder to its owner that only 500 of these unique machines exist. Great attention to detail was taken into consideration when designing the genuine leather two-tone seat with embroidered SCL logo, and matching beige and red stitching – keeping the discerning cruiser customer in mind. Over time, the seat will develop a character of its own and will be unlike any other. The top panels of the seat have leather grain for 2014. The Raider SCL features newly developed, aggressive, robust, dark Matte Iron paint accented with a Matte Raven color including unique pin striping on the front / rear fenders and headlight. The bike delivers premium quality the discerning rider is looking for. A new blacked-out theme embodies the Raider SCL with black components throughout: oxidized titanium coated fork tubes, push-rod tubes, forks, exhaust, air cleaner box, wheels, meter panel, switch gear, and master cylinders, just to name a few. The 2014 Raider SCL simply stands out from the crowd. The limited production Raider SCL is loaded with premium cruiser features. Crafted for riders who value exclusivity, only 500 of these exceptional machines will be built.